Basketry is a great project for 4-H groups. There are baskets from very beginning Cloverbuds to those who have been doing them for several years. In an effort to teach a progression of baskets, that teach new skills each year, we have come up with a selection of baskets to choose from. 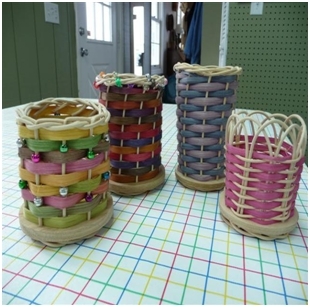 Once these skills have been mastered, students are free to design a basket based on many samples in the shop. Please contact Kathy to schedule a class. Most baskets can be completed in about 3 hours. Some of the more intricate ones will take more than one class, but we like to limit the class to 3 hours at a time. Baskets must be started one month prior to fair.